Griot's Garage Microfiber Wipe Down Towel - 18 in. x 24 in. It all started with Tim. He's a customer who loves our Micro Fiber Dry Towel but doesn't like staining his towels when he dries those tricky, hidden dirty areas of his vehicles, like wheels, doorsills, gutters, trunk and hood channels, doorjambs, etc. So I created a less expensive, smaller towel just for these areas that always have a little dirt and grime, even after a good washing. This towel is a perfect size, 18" x 24", so it is easy to use. 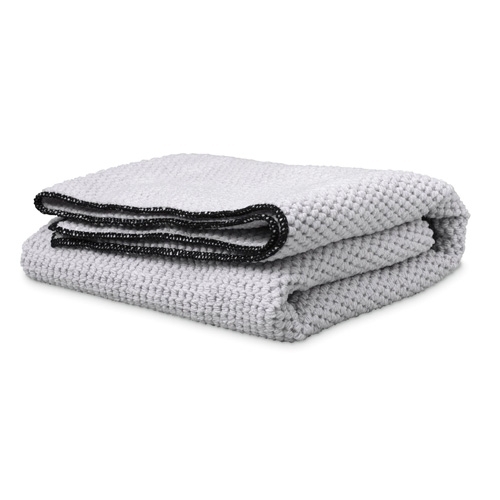 Super absorbent, waffle weave pattern holds more water than a traditional cotton towel. Quality woven micro fiber, just like our big yellow Micro Fiber Drying Towel. Washing machine safe, but don't forget to use our Micro Fiber & Foam Pad Cleaner. Griot's Garage Speed Shine - 22 oz. Micro-Restore Microfiber Detergent Concentrate - 32 oz.